From April, 19th to April, 21st 2017 I have been a guest teacher for a three-day workshop at the 17th International Push Hands Meeting in Hannover. Concerning the participation at this event I want first of all to cordially thank Mrs. Huang Tsui-Chuan who has been running her own Tai Chi School “Shan Shui” in the Freiburg area for more than 20 years and has invited me since 2012 every year to Germany to hold a Tai Chi seminar. In her work, Mrs. Huang strives to make the Chinese movement arts understandable to the people here and to get across the essence of this precious culture. It is by her recommendation that I got the opportunity to come together with all friends who are interested in the Tai Chi culture and are active in this field for many years. It was an interesting and unforgettable experience for me. History tells us that the soft style of Tai Chi Chuan was at first made known by Yang Lu-Zang, the founder of Yang Style Tai Chi. By applying the basic techniques of Ba Men Wu Bu (eight doors and five steps) he made himself “Yang Wu-Di” – the invincible Yang. Since then, Tai Chi Chuan enjoys a high reputation as an internal martial art. 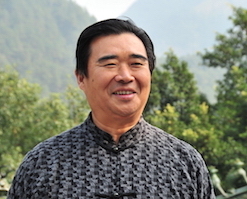 As a cornerstone, Yang Lu-Zang has transformed the quality of the martial art from the fighting aspect to the way of cultivation. Instead of competition with techniques and muscle power, which stresses a harder approach and often leads to bloody actions, the yielding as a basic principle of Tai Chi Chuan took on a new dimension. Push Hands is used in schools for the training of this aspect. Nowadays, Push Hands – as a method which can serve both to reduce aggression and to solve conflicts – can also be practised for harmonious coexistence. To my great pleasure, I have experienced such a Tai Chi spirit at the International Push Hands Meeting in Hannover. There, the participants practised peacefully with one another, independent of style and nation, and there was not any competition and therefore no winners and losers, no better or worse practitioners. It was about being together to research the method and exchange experiences. The roles of the learner and the teacher were intermixed. By testing and reacting, the ability to go out of the way of an attack and the skill to hear the energy were to be developed. Although not all participants were able to communicate by means of language, the open heart for the body contact was enough and the communication was complemented by a friendly smile. In practising, peace and harmony between the humans is welcome. So, we hope that Push Hands may contribute to provide a basis for peace on earth. Yet, a happy gathering at such an event with more than 100 participants form 8 nations is not only a question of complicated logistics, but also of a generous heart and a flexible ability to act. Without a great love for Taiji culture and full commitment, it would not be imaginable that such a big event could get underway and take place in a peaceful way. The almost selfless and charitable way of acting of Nils Klug has moved me deeply. For being able to practise Push Hands in Hannover in a pleasant ambiance and an open atmosphere, we all have to thank Nils Klug with all our heart. Furthermore, the Gala evening was colourful and for me it was impressive to see how widely the Chinese martial arts are spread and how many people already occupy themselves with them. I enjoyed the presentation of different forms of movement and the demonstrations of the guest teachers from different countries very much. Especially the easy-going and humorous style of the moderator, Mrs. Angela Menzel, impressed me as well. 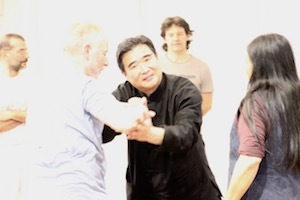 – The basic principles should be described clearly in connection to the Tai Chi Classics. – There should also be more time for the exchange between the teachers. At this point, I wish the Taiji Forum good luck with further events of Taiji culture and Nils Klug health and strength. Yonghui Deistler-Yi and Yang Yun-Zhong about the Push Hands Meeting in Chinese.